Tasks are a Starter plan feature. The main purpose of Tasks is to provide an extra level of hierarchy within Projects. In other words, think of them as a sub-project. Similar to projects, tasks can be allocated to a specific team member. Open the project under which you want to create tasks. Make sure you're positioned under the "Tasks" tab. Use the "Add new task" field at the top to create new tasks. Click "Add" to confirm. Edit tasks by clicking on their name. The app will automatically show a prompt to enter a new name. Assign tasks to certain members of the current project’s team. Set Time Estimates for Tasks and review the progress of each visually. Mark Tasks as done / as active. 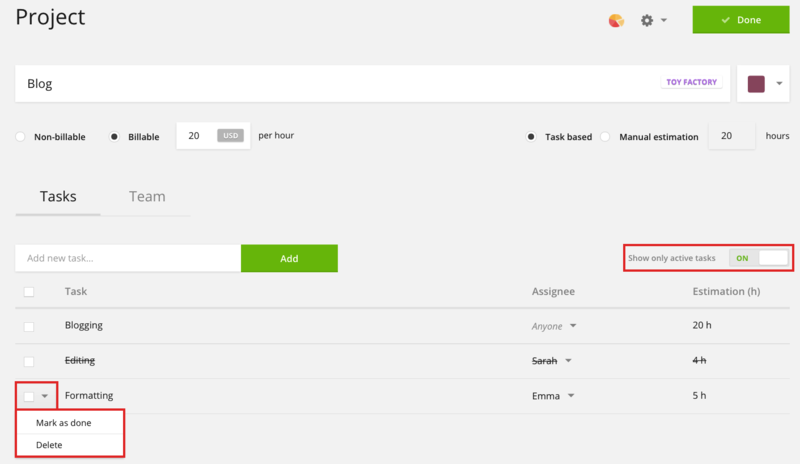 To hide completed Tasks from the project list on your Timer page you can mark a Task as Done. Entries recorded under your Done Task will still be available in Reports. Tasks can be reactivated by marking them Active. Search for the task name from the "Project" field when creating time entries. If you have multiple tasks with the same name listed under different projects, they'll be grouped accordingly. What happens to tasks if I cancel my subscription? Time entries created under tasks will remain, however, the task label will be invisible. In other words, tasks-related data won't be deleted, just hidden from view. If you renew your subscription task names will be displayed again.